For the remainder of the NBA season, The Triangle will be breaking down the biggest games of the week. Today’s edition: Dallas-Denver. Poll position in the race for “Team You Don’t Want to See Come Playoff Time.” Right now, Dallas and Denver are the no. 6 and no. 7 seeds in the West, respectively, and each figures to be a team that those atop the conference have no interest in seeing. Dallas stumbled early in the year, but (as should be expected for a team with a long offseason coming off a title) many of its key pieces are coming into form. Dirk Nowitzki’s past four games (27, 27, 27, and 33 points on a combined 54.7 percent from the field) are enough to scare anyone, and Rick Carlisle believes Lamar Odom is finally settling in after some conditioning and personal issues. Dallas has been surprisingly strong defensively, despite losing Tyson Chandler, and as its offense begins to take shape, a team like the Lakers should have no interest in seeing them in the first round. For the Nuggets, the fear is in what they might look like a month from now. In the past week, Denver has added Wilson Chandler and JaVale McGee to a roster already deep with NBA bodies. If the playoffs began today, Denver and its 10-deep bench would travel to San Antonio to face an aging team that might struggle with the nonstop flow of shooting, quickness, and length that George Karl has at his disposal. The effect that slew of guys on Denver’s bench brings was evident in the third quarter. Dallas had put together a 16-point lead with nine minutes remaining, but it never really felt safe. 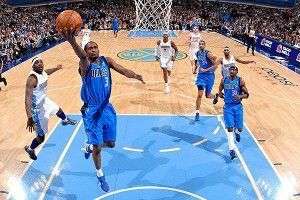 Barely a minute after the Mavs had pushed it to 16, 3-pointers by Al Harrington and Arron Afflalo and a Ty Lawson layup had it back down to 10. Even without Danilo Gallinari (who broke his thumb in the third), the Nuggets were staffed with enough shooting and scoring to keep the game within reach. The blink-and-you-miss-it moment wasn’t a moment as much as it was a sequence at the end of that quarter. After Denver cut the lead back down to 10, the Mavs spent the next three possessions showing why they’re the team no one wants to see. Jason Terry began the stretch with a move to the rim that he finished with a short pull-up to take the lead to 12. Rudy Fernandez’s 3 for Denver took it back to nine, but then Rodrigue Beaubois, absent from last year’s playoff run, drove down and hit a floater over his defender to push it back to 11. Nowitzki followed a missed 3 from Harrington with a 27-footer of his own to put Dallas back up 14 going into the fourth. There was nothing overtly special about that minute and 12 seconds, but it contained everything that makes the Mavericks dangerous. What allowed Dallas to find so much success in last year’s playoffs (aside from Nowitzki’s dominance) was having guys who were shot-makers. As the playoffs approach, and the game tightens up and open looks become more and more difficult to find, a roster full of players (Terry, Beaubois, Odom) capable of getting and making shots will be one of Dallas’s biggest advantages. Dirk Nowitzki. Oh yeah, that guy who completely took over last year’s playoffs and vaulted himself into conversations about being one of the 25 greatest players ever — he’s still around. Dirk scored early, often, and easily last night as Denver struggled to find anyone or any way to stop him. Then again, that’s the point. When Dirk is doing what he was last night — getting the ball low and hitting that short fall-away, hitting every open 3-pointer, finding cutters off double teams — he’s virtually unstoppable. Dirk added six assists to go with 11 rebounds and 33 points on 19 shots. Whether it was Kenneth Faried, Chandler, Afflalo — anybody — Nowitzki was in the form Monday night that makes Dallas a terrifying matchup in the first round and beyond. It’s early. McGee, acquired from Washington before the trade deadline, didn’t even play. Wilson Chandler was in his first game back from China. Gallinari left the game early. With McGee in the fold, Denver has a handful of different lineups that will give teams fits. The small-ball squad they trotted out Monday — Lawson, Afflalo, Chandler, Gallinari, and Harrington — staffs five guys who can step out behind the 3-point line, and with McGee, they’ll be able to work in a proven basket-protector that this team has lacked. No one has seen these Nuggets as a collective unit, and with a bit of time, they’re a team that no one should want to play. Beware of the Mavericks. Monday night was not only Nowitzki at his best, but also Dallas at its best. The Mavericks moved the ball on offense in a way they haven’t all year, finishing with 32 assists on 45-of-84 shooting. Six players finished with at least six assists, and Dallas was able to get the ball where it wanted, when it wanted. Along with its offense, the Mavs showed what sort of problem they will be defensively for teams moving forward. Chandler is gone, but he’s been replaced with a lot of length in the frontcourt, and last night Ian Mahinmi (11 points) and especially Brandan Wright (15 points, six rebounds, and a block) represented the defense at the rim that Dallas is going to need moving forward.